Managing the clipboard jobs on Windows computer are considered to be the most tedious tasks. Hence you can use 1st Choice Free Clipboard Manager application to simply walk through the clipboard works without any hurdles. Not only this the tool helps in posting the visual graphics directly to the email box of the browsers. This utility has the capacity of copying and pasting around 25 images. Along with the said features, it gives the users choice of few other features like wiping the clipboard, editing the clips and screenshot. 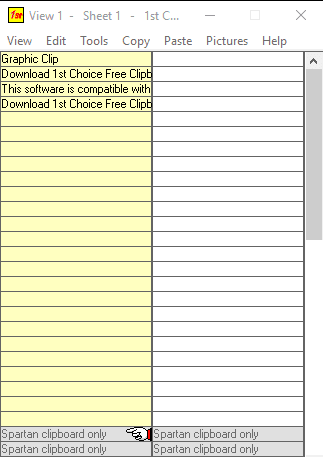 The yellow portion of the Clipboard manager which has a sum total of 25 cells, is termed as the multi clipboard. After cutting or copying any image, this utility targets to capture the clip. Furthermore, it will again store the same image into the disk. With this, it becomes very simple to showcase a default name for the pictures in one of these cells.